Bauer College students Ross Perez, Shane Gossard, Benjamin Goss, Franco Rivero and James Greene were among the world’s best at the 2nd Annual Academic Challenge at the CoreNet Global Summit, besting 39 other university teams from around the globe. 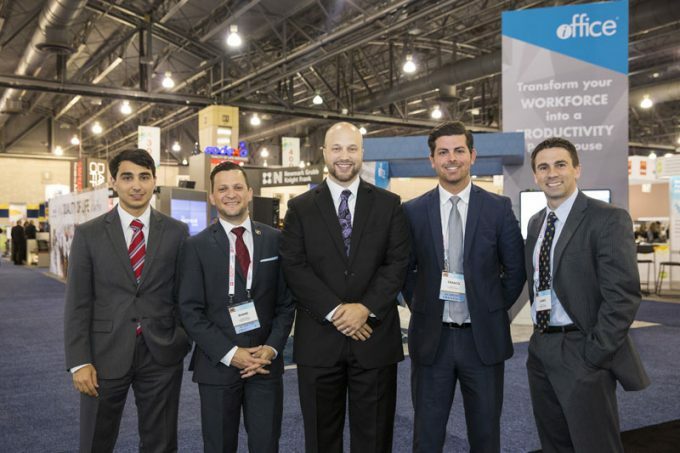 A team of four graduate students from the C. T. Bauer College of Business were named finalists recently in a global real estate competition during the 2nd Annual Academic Challenge at the CoreNet Global Summit. Full-time Bauer MBA students Benjamin Goss, Franco Rivero, Shane Gossard, James Greene and undergraduate student Ross Perez were among the world’s best at the 2nd Annual Academic Challenge at the CoreNet Global Summit, besting 39 other university teams from around the globe, including The Nederlands’ Eindhoven Technological University and Indian Institute of Technology – Bombay. During the competition, teams were assigned a specific industry and tasked with creating a plan to redesign the office space of an organization within that sector. The Bauer student team was charged with the manufacturing industry and spent the first half of the competition interviewing industry professionals to fine-tune their proposal. Before the summit, the team received guidance from Bauer’s Real Estate Program Executive Director Keith Richards, who helped coordinate conference calls with industry experts in preparation for the competition. The team also met with Gerald D. Hines College of Architecture adjunct faculty member Sofia Fonseca, who presented at the conference and has experience in corporate real estate. Once the team developed their strategy, they presented their plan to a panel of CoreNet judges. “We concluded that there needed to be more open and shared spaces, with breakout areas like you might see in Bauer buildings, where teams can meet, as well as private locations where you might be able to meet one-on-one and do your annual review with your boss and not have people interrupt,” Goss said. According to the students, the competition gave them a firsthand introduction into the world of corporate real estate, while allowing them to apply some of the skills they’ve learned throughout their time as Bauer students.